My mate and I gave Inskip another go last weekend after having a mildly successful first trip up there a month or so ago. We slept at the ramp on Friday night after a 4hr drive from Ipswich. 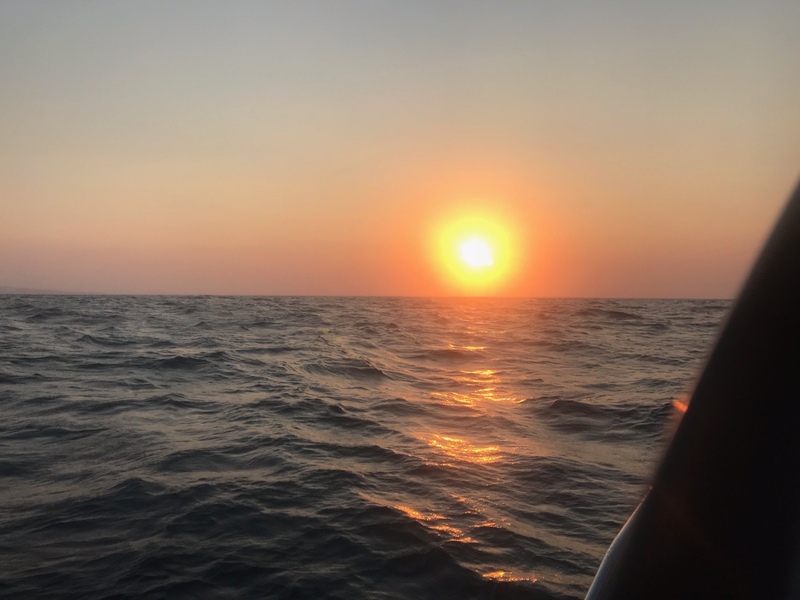 After not much sleep we were up at 3.30 and away for 4am heading 30km east to our mark that produced undersized Reds, big amberjack and a few bricks on our last trip. Our mark was once again covered in bait but there were no obvious arches or red blotches in amongst it on the Furuno. Turns out it was a big school of Trevally. 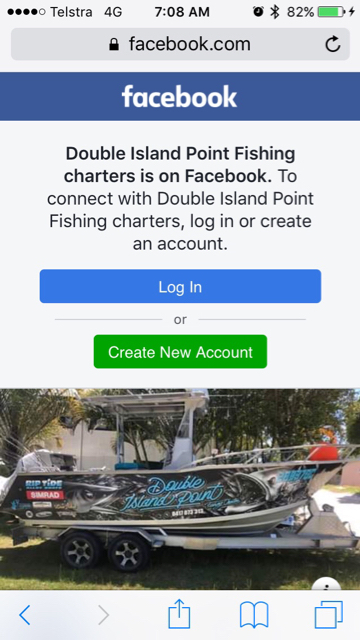 After catching some trevally on Pillies and on the bait jig we were encouraged to move on by a local charter boat who pushed in on our drift then anchored right in front of us on the mark. 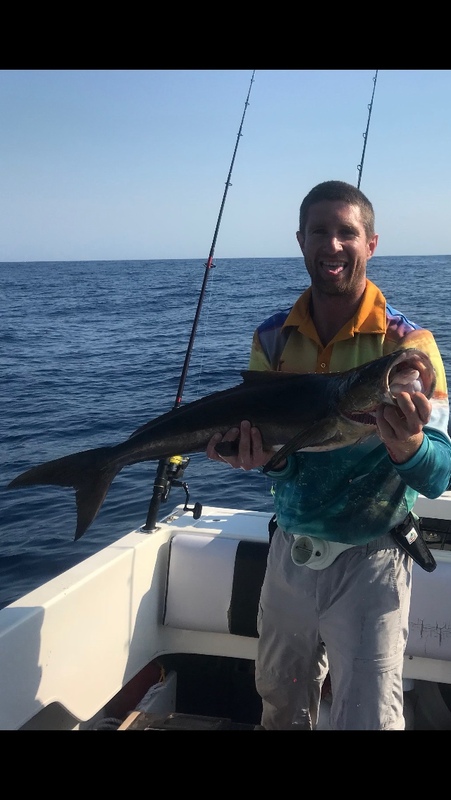 We pulled up an 8kg Cobia just over 1m long before the charter boat had arrived so we were happy to leave him with the trevally and look for some new ground. 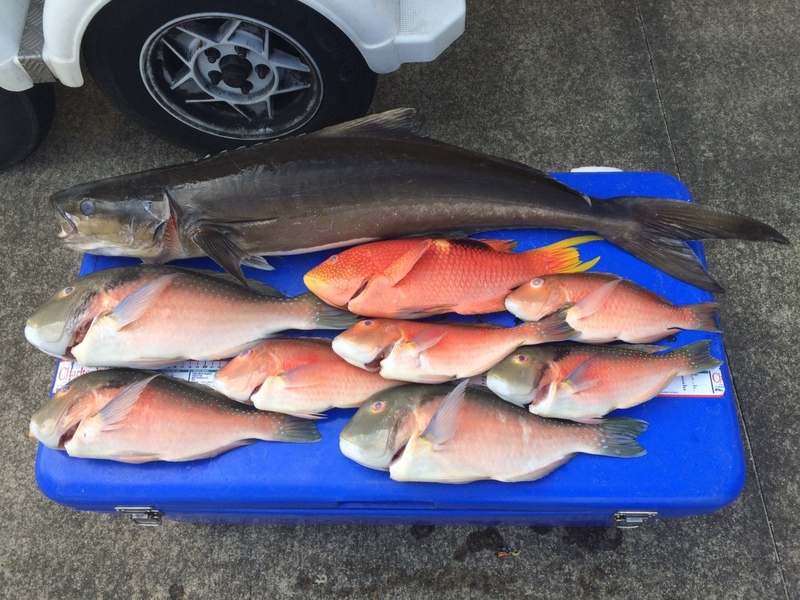 We sounded up some small reefy patches and managed to get a few Tuskies in the esky and a gold spot wrasse. 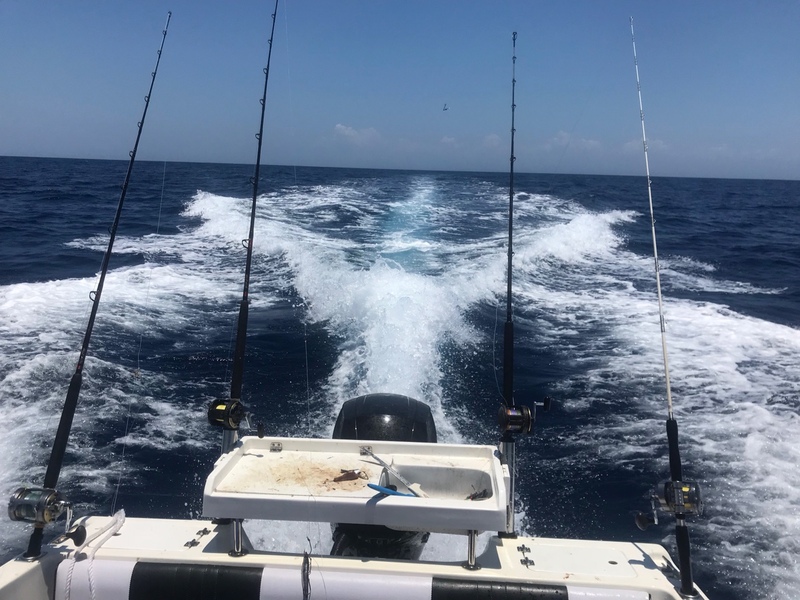 A dolphin fish turned up at the back of the boat in 60m of water and took an unweighted pilchard but managed to pull a hook off my mates 3 hook gang while jumping around. Two more turned up half an hour later a bit further north but were not interested in eating. They are a great fish to look at in calm, clear water. The wind picked up quite a bit around midday and the plan to stay out and fish the night was cancelled so we headed back to the lagoon for a calm night and headed back out for a morning session on Sunday before heading home. Sunday saw a couple more Tuskies in the esky and a lot of just on legal and just under legal pearlies thrown back along with some undersized squire. We were happy with the effort considering the winds and headed home. Keen to head back up that way next winter in the cooler, calmer weather and head further out looking for the elusive Reds. DI seems to have an abundance of scattered reef and I can see a lot of time on the water required to fish it well. Any advice or tips people might want to share would be greatly appreciated. Feel free to post or PM me. This was our second trip up there and I'm trying to do a lot of research ready for next winter. Nice work. I had a similar trip planned up until Thursday evening when my decky pulled out. Ippy-that area Friday, one last weather check on arrival and either hit inside of Fraser or punch offshore. Having not gone wide from there I probably would have tried Fraser again. Out of curiosity what did the charter boat look like. Give him some stick on Facebook, is always entertaining, I want to hit DI next winter as well hopefully have all the boat issues sorted out by then, have been studying batho charts for some good grounds so would be interesting to see what they look like on the sounder!